Winner of the Campiello Prize. A pitch-perfect rendering in English by Ann Goldstein, Elena Ferrante's translator. "I was the Arminuta, the girl returned. I spoke another language, I no longer knew who I belonged to. The word 'mama' stuck in my throat like a toad. And, nowadays, I really have no idea what kind of place mother is. It is not mine in the way one might have good health, a safe place, certainty." 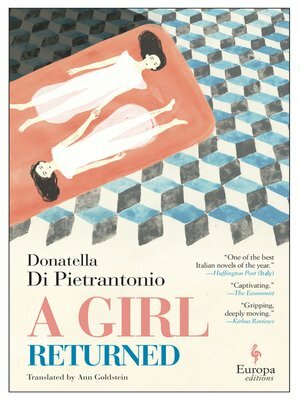 Told with an immediacy and a rare expressive intensity that has earned it countless adoring readers and one of Italy's most prestigious literary prizes, A Girl Returned marks the English-language debut of an extraordinary literary talent. Set against the stark, beautiful landscape of Abruzzo in central Italy, this is a compelling story about mothers and daughters, about responsibility, siblings, and caregiving. Without warning or explanation, an unnamed 13-year-old girl is sent away from the family she has always thought of as hers to live with her birth family: a large, chaotic assortment of individuals whom she has never met and who seem anything but welcoming. Thus begins a new life, one of struggle, tension, and conflict, especially between the young girl and her mother. But in her relationship with Adriana and Vincenzo, two of her newly acquired siblings, she will find the strength to start again and to build a new and enduring sense of self.